President Trump and North Korean leader Kim Jong Un are planning a second summit. Trump received a letter from Kim calling for the summit. The two leaders met for the first time in June in Singapore. Kim wants a formal end to the Korean War while Trump wants a solid commitment to denuclearization. South Korean news agency Yonhap quoted National Security Advisor John Bolton, who revealed that Kim, in a conversation with the South Korean leader Moon Jae-in, offered to denuclearize within one or two years. Most so-called experts have opined that Kim and North Korea will never denuclearize. CNN news anchor Erin Burnett said at the time of the first summit that "there's no way around" Trump being a "great president" if he achieves a deal with North Korea. If Trump can achieve the goal of North Korean denuclearization, many on the political left and the NeverTrumpers will eat crow, as they have predicted it can't happen. Kim wants a deal before the end of Trump's first administration, as he appears wary of any presidential replacement and the prospects of an equitable deal with anyone but Trump. Meanwhile, Trump has reacted positively to the new overtures, tweeting, "We will get it done together!" 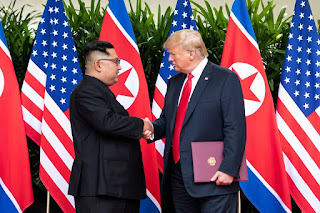 Peace with North Korea, an official end to the Korean War, and a denuclearized Korean peninsula. Sounds like a slam-dunk Nobel Peace Prize for Trump when all is said and done.